After 2 years of planning, finally this long awaited trek came to fruition. This is an account of how we did it. 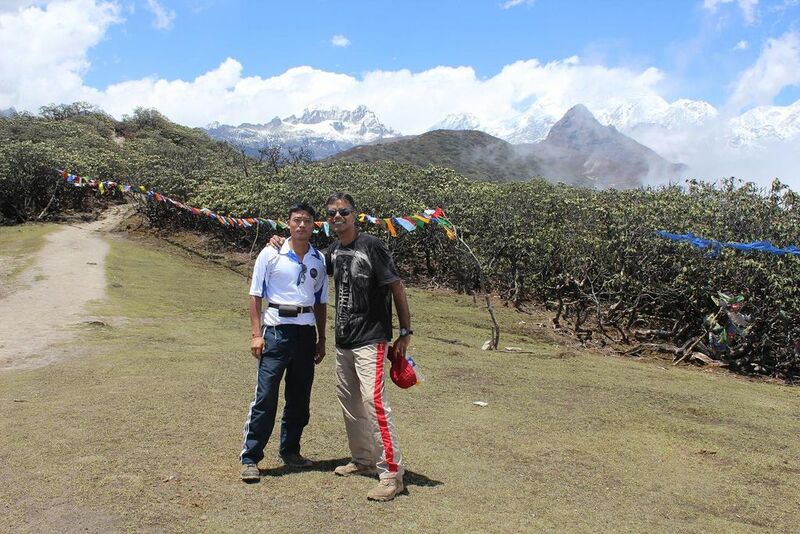 This is the famous Goechala trek, one of the most rewarding and strenuous treks around. While planning for the trek, I did a lot of reading up but the information that I was hoping for was not available, so I will add bits here that I hope will prove to be useful for others seeking similar info. 1. I have uveitis and have had trabeculectomy in both eyes. Would the eyes be able to handle the strain and the altitude? – I just had a few niggles but all in all, absolutely no problems so all those with a similar ailment … go for it! 3. The importance of the right group… great friends or preferably family, who eggs you on…cannot be understated. I saw a few instances of people competing to be faster and then having over extended themselves, struggling in the later stages. Its very important to remember that a trek is meant to be enjoyed and we made a point of enjoying the scenery all the way through and moving steadily and constantly along the way. This ensured I have some lovely memories and we also completed an 8 day trek in 5 days without straining ourselves I thank my bros for sticking with me and being making it the most amazing trek I have had in a long long time. 4. To save energy and strain, try zig-zagging up steep slopes. This ensures you exercise your muscles equally. Also, do have a reliable, strong walking stick at hand at all times. 5. 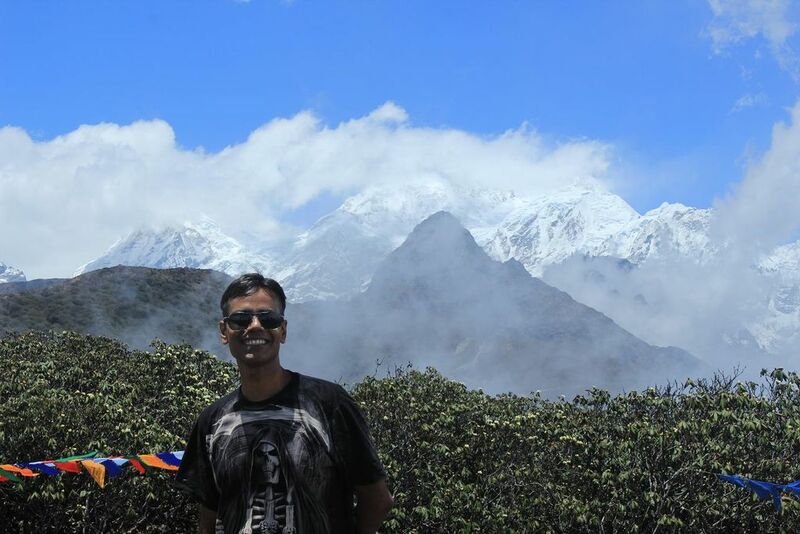 Since I was trekking after a long gap, I wasn’t sure how I would hold up to high altitude. I had Diamox in the night at Yuksom and then had Diamox in the morning at Tsokha and in the night at Dzongri. I also ensured that I did not overextend myself and drank plenty of water. Needless to say, I had absolutely no problems with AMS. Thats about it, on with the report! Im not going to put up too many pics since I am on a very bad internet connection. I will add more pics slowly over the next few days. Today we reached Yuksom after a drive down from darjeeling via Jorethang. A pretty steep incline down the Tukvar tea estate road, Jorethang was sweltering in the heat. The road then climbs up, past the Tatopani complex (hot springs) and reaches Legship from where its about an hour to Yuksom via Tashiding. Its peak trekking season and we learn that a huge group of trekkers has just left for the trek, leaving Yuksom devoid of porters/guides/yaks. After a lot of searching, questioning, pleading, we finally find a young cook – Birkumar Rai, who arranges his friends as porters. Evening 7 pm and we are finally done with the ration shopping and retire to our dormitory rooms in the Wild Orchid hotel (which was actually totally empty with us being the only guys staying!) We have our beers and whiskies and have a nice dinner at the Gupta Restaurant in town and trn in for the night. Cook rate – 500 per dayporters – 300 per day.yaks are 250 a day but you need to hire a pair. sadly there were none available. Yuksom has a number of restaurants and you can find all kinds of food – veg/non-veg, so there is absolutely no problem on that front. Yuksom is also home to the coronation throne (from when the first king of sikkim was crowned) and a monastery with huge prayer wheels, coated with 7.5 kilos of gold. We did not hire a tent, our plan was to stay in trekkers hut at all places. As it is, each of us had pack loads of between 15-20 kilos to carry (with mattress/sleeping bag etc) A tent is useful in Lamuney since there is no trekker hut available BUT if you are lucky you could adjust with the porters and cooks and sleep in the dining tent or the kitchen itself. The trek begins with clear skies and glorious sunshine. he initial phase is reasonably easy with gentle inclines and descents, through dense green sub-alpine/tropical forests. We tread carefully past the landslide zone and move further into the rolling hills. Birdsong accompanies us and every 10-15 mins, there is a bend that opens out lovely vistas of blue-green hills with waterfalls peeking through. The first bridge is not too far off and the sound of the thundering white waters signals the approach. Depending on your speed, it could take between an hour to 1.5 hours to get to the first bridge. Its a suspension bridge with clear blue waters gushing below and rising up as a misty spray. Cross he bridge and start climbing up aain (there was a new gate being constructed at this bridge, perhaps this will be a new checkpost pretty soon) The path goes up ….up … and then plunges down by almost the same elevation. We get used to the constant rise and dips and there are a few common grumbles – you rise up and gain height … only to lose it again. Thats the nature of the trek though, as it goes up and down the hills. The second bridge takes us by surprise about 45 mins to an hour after the first one. This is a pretty small one and not as spectacular. Cross it and proceed into the jungle again. About 15-20 minutes into the jungle we start hearing the roar of a stream in the gorge below. That makes us think that the 3rd bridge is just round the corner… BUT thats an illusion .The path just keeps going up and down along the gorge (you cannot actually see the gorge) but it takes a long time to get to it. An hour out from Sachen and we finally reach the third elusive bridge (Preakchu Gorge) We do pass a mini bridge along the way but thats not very spectacular. This one has white water rushing down (it comes all the way from Thansing via Kokchurong) and with sweat dripping off my clothes and even my cap! its a pleasure to take off the backpacks and rest for a while at the bridge and enjoy the cool wind speeding through the gorge. We have some Chamba (corn flour) and wai wai and then proceed to what will be some seriously tough climbing. Just after the third bridge is where the real McCoy begins…the ascent to Bakhim has a steep gradient that is relentless and we proceed slowly through the dense cover. Its a real torture to the legs and the lungs but when you come out of the forest and into Bakhim, the view is fantastic. 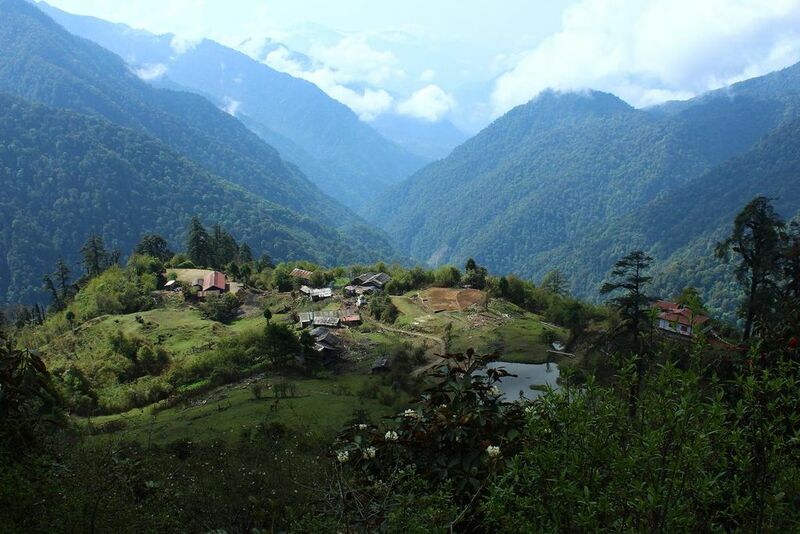 We can no longer see Yuksom and out in front of us are the thickly wooded hills with mist sprayed around lavishly. A deep valley shows us why the climb was so torturous. 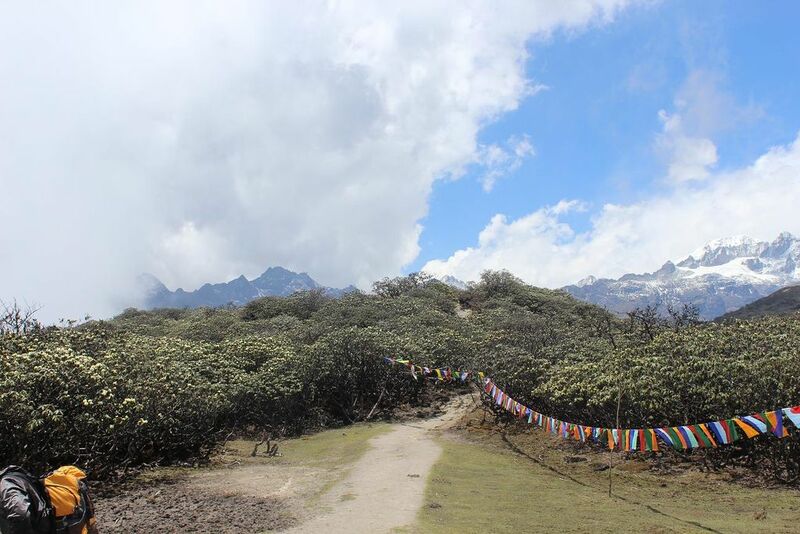 We begin the walk up to Tsokha through lush meadows and forest with a few deodars scattered around. My legs and lungs are protesting but I have a simple technique. Aim for a target bend, climb up till there, stop for 5 seconds to catch breath and move on. Incredibly effective and in a little more than an hour, we reach Tsokha by around 5 pm. Dump our bags into the trekkers hut (which is a pretty cosy and warm little hut with mattresses and pine panelling and of course some v interesting graffiti) The trekers hut at Tsokha is the best we will meet enroute, with 4 toilets, all having a ready supply of water. Day 1 ends with sore shoulders and tired legs. Make no mistake, the initiation has not been easy and including all stops taken to enjoy the scenery and relax, it has taken us 8 hours from the time we set off from the forest check post. We get a lovely view of Mt Pandim as we brush our teeth behind the kitchen. Freshened up, we have some tea and Tibetan phale with jam. Up and at ’em, we begin our march to Dzongri around 7 am. 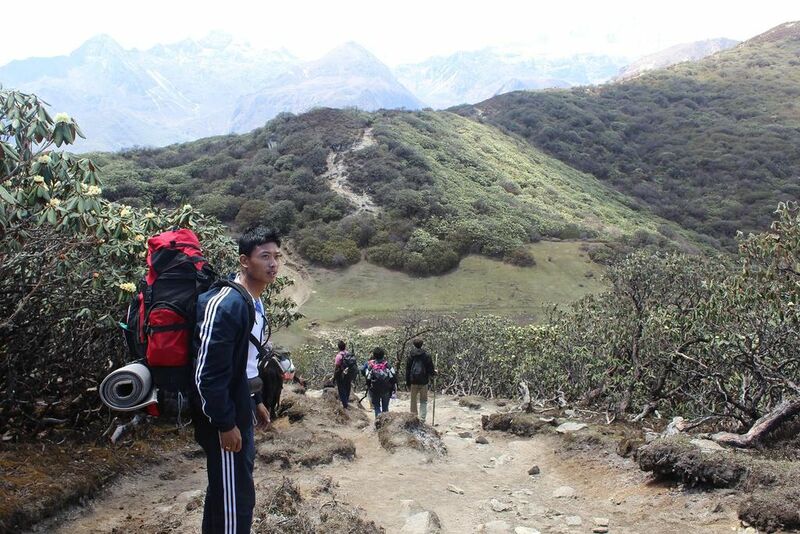 The trail is well defined and wide, and in the beginning, has wooden slats to make it easy for trekkers. The climb is fairly easy (as compared to yesterday) and we make good progress through the sun dappled woods. A few chimul (rhododendron family) flowers pop in and out along the trail and birdsong greets us everywhere. Phedang is a clearing almost cresting the ridge and im sure would be offering some great views but by the time we reach it, the clouds have gathered around us, obscuring the views. Phedang also has a trekkers hut if anyone wishes to stay here. As I scramble up with renewed energy, the sight that greets us is stunning. Deorali is a long flat plateau. In front of us are yellow rhododendrons on all sides and beyond them is a stunning vista of awe inspiring peaks glistening white in the sun as the clouds weave in and out. The chill wind whips along the plateau as we watch the clouds race past and dip under and over the majestic Himalayan range. Finally we move on down the trail that leads on down the valley onto the next ridge that we need to cross up and over to eventually each Dzongri. After climbing the ridge, we pass over a small stream that is still frozen over (a bit of a surprise that!) We can now see Dzongri glistening in the distance as the sun comes back out from behind the clouds in all its glory. Its 1 pm and we have finally reached Dzongri and settled in. We take off our sweat stained clothes and put them out to air and dry in the sun that thankfully is blazing away today! As it gets on towards evening, the clouds gather in the distance, blocking out the hills and we can see the rain/snow come down in the distance. 8 pm and we are asleep, preparing for the climb to Dzongri peak for sunrise. Late in the night, just as yesterday, the clouds roll in again and with the usual lightning show at around 11 pm … for about an hour, they thankfully depart. After having woken up during the storm and rain, we go off to sleep again around 12 am hoping for clear skies the next day.